35% LIGHTER WEIGHT – ONLY 760 GMS. & Carnatic Musicians Young & Old, Artists & Students alike. Original Tanpura Sound Using the Latest Cutting Edge Technology. Accurate Pitch: This Electronic Tambora comes with a Super Stable Accurate Digitally Tuned Pitch. A Quality Found in No other Tanpura. Vocalist as well as Instrument. Pancham, Madhyam & Nishad: The Raagini Digital comes with Easy Switch Operation for Selection of Accurately Pre tuned Panchan, Madhyam & Nishad. 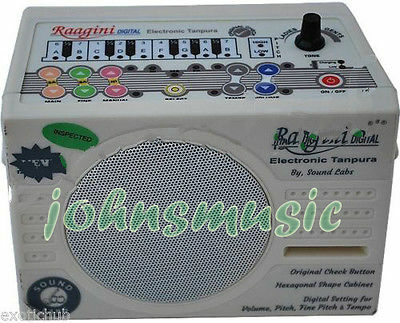 Manual Nishad Tuning: In the Case if Nishad, Raagini Digital Tanpura Also allows you to Manually tune the Nishad to adjust to your special needs. Fine Tuning: The Raagini is Equipped with a Digital Fine Tuning, that works with Immense precision for it to Tune with your Instrument. 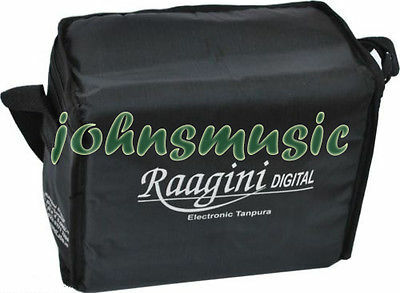 In-Built Battery Charger: The Inbuilt Battery Charger of the Raagini Digital, Charges Rechargeable Battery even when the instrument is Playing. External Speaker Socket: The Raagini Tambora has an External Speaker Socket to Connect it to Bigger External Speakers if Necessary. SMPS Power Mode: Raagini Digital comes with One SMPS Power Input system so that it can be used Worldwide. It works fine 90 V AC to 250 V AC. Raagini: 7 Inches * 4 Inches * 5 Inches.